NOTE: Web only special pricing. This is a special limited edition item with limited stock available. 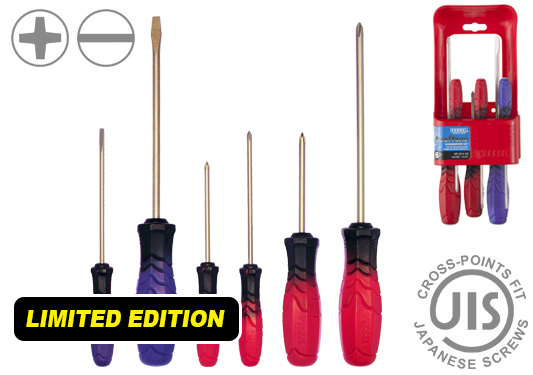 The Dual-Tone Series screwdrivers are idea for automotive, industrial, and general fastening applications where oil may be present. The oil and chemical resistant octagonal shape handle provides a comfortable and secure grip and features wavy grooves to help avoid slippage with greasy hands. It’s outfitted with a fully hardened chrome vanadium steel shank, precision machined magnetic tips, and an electro-less nickel-plated finish for a better tip/screw fit..
Other features include a color-coded for easy tip type identification and a convenient hand carry storage case which converts into a wall mountable tool organizer. Also, the cross-point tips fit JIS (Japanese Industrial Standard) screw heads nicely so if you are working with Japanese made products, it will help prevent cam-out while fastening. Note: The +0 size cross-point size are JCIS-based (Japan Camera Industry Standards).